The citizens of Europe are facing increasingly complex challenges to their career development nowadays. Over the span of their lifetime, they need to manage their careers, and make numerous decisions concerning education, training and employment – decisions, which seriously impact their futures and their wellbeing. To prepare citizens for these challenges, and to support them in the progress, competent career practitioners are needed. But what kinds of career practitioners are we talking about? And what do they need to be able to do? How can the quality of their training be assured? 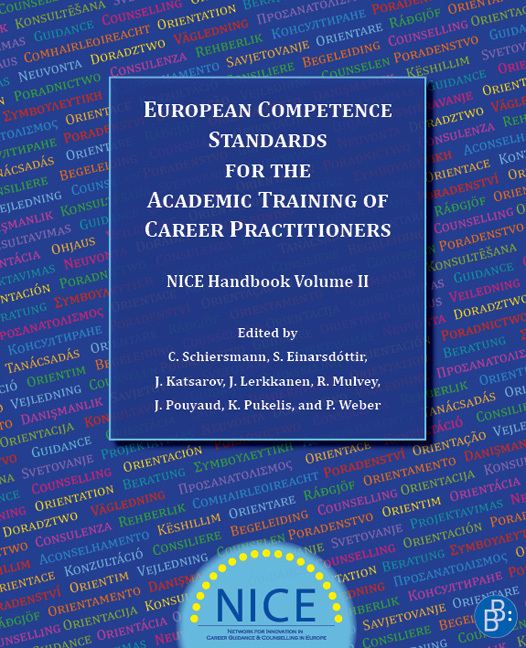 This handbook introduces common European competence standards for the academic training of career practitioners in Europe, together with some proposals and examples, of how to implement and establish such competence standards in practice. More than 200 experts from all across Europe have contributed to the development of these shared standards of the Network for Innovation in Career Guidance and Counselling in Europe (NICE). The standards are already being used in many countries for the development of degree programmes.